Transition Town Guildford and its members have been fund raising for Citizen’s Own Renewable Energy Network Australia (CORENA) for over a year now, collectively contributing over $1,100 towards various projects during this time. We were very excited to learn that CORENA’s next project is in WA: the Nannup Community Resource Centre is next in line for a 10kW solar PV system, and it won’t cost them a cent. TT Guildford has already chipped in towards this project, including $50 raised at our monthly movie night this week. We invite you to chip in too, which you can do here. CORENA (Citizens Own Renewable Energy Network Australia Inc.) provides interest-free loans of up to $20,000 to pay for community projects consisting of solar PV installations and energy efficiency measures for non-profit organisations. Recipient organisations pay back the loan just out of the resultant savings on their power bills, generally within 5 years. After that, the organisation continues to enjoy lower power bills for another 20-25 years, meaning more of their funds will be available to spend on valued community services. Loan repayments from CORENA’s first 4 projects help to fund the Nannup solar PV installation, and the rest of the funds will be sourced from donations from people all over Australia, not just the Nannup area. TT Guildford is proud to be a contributor. Loan repayments from the Nannup CRC project will feed back into CORENA’s revolving funding pool to help fund future Quick Win solar projects. Once around 20 community funded solar projects have been completed, the funds in the revolving pool will be sufficient to continue funding one new project every month, forever, without needing any more donations. CORENA is a non-profit organisation run entirely by volunteers. CORENA has raised over $57,000 to provide interest-free loans for solar power to non-profit community organisations in all parts of Australia. Over 40kW of solar PV capacity have already been installed, saving each of the respective community organisations thousands of dollars that are now available to serve the local community. 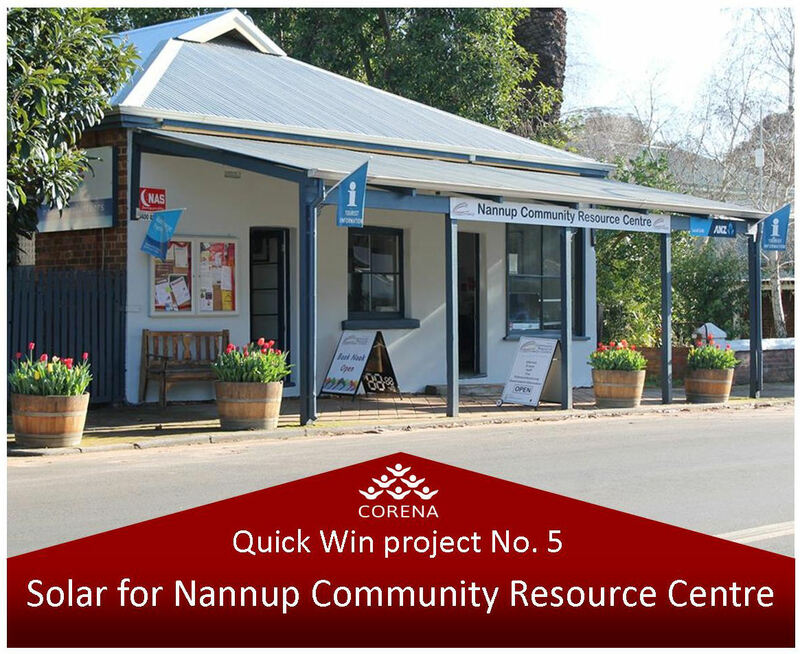 Nannup CRC is CORENA’s 5th project. This entry was posted in Community, Economics, Energy, Movies, Take Action and tagged community, Community energy project. Bookmark the permalink.